I hate wearing Mascara, I'll happily admit that if it completely didnt ruin my real eyelashes I'd wear fake eyelashes 24/7. I just dont like the feeling of it on my eyes at all, However if I didnt wear it I'd look ridiculous as I have super light lashes. I've had them tinted in the past too they still look ridiculous! Lash extensions are out of my price range too, so for my own vain ways I have to suffer wearing mascara. 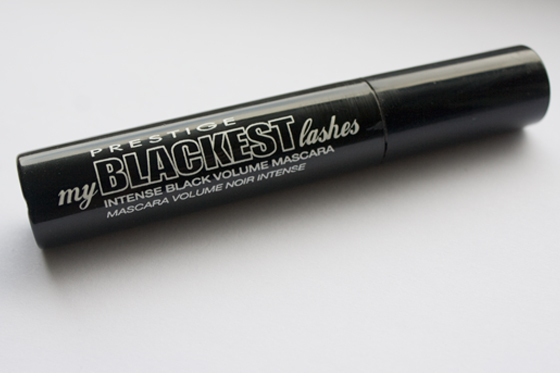 The Prestige My Blackest Lashes mascara is a true black which gives a great amount of volume and length. It gives pretty instant thickness results so you dont have to keep applying coats and coats so it goes clumpy or dry. The brush is one of my favourites as its so small and great for getting into the lashes. 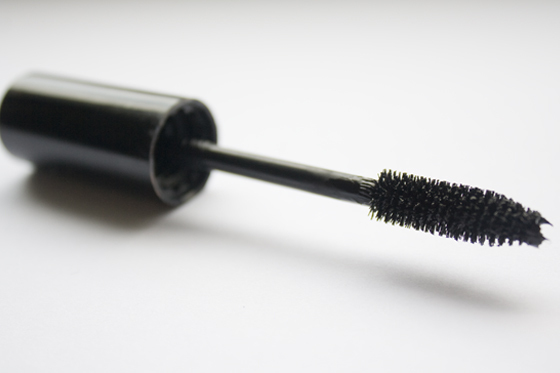 There is a really annoying trend in mascaras at the moment with the JUMBO brushes which make it so hard to apply properly without getting it on your eyelid! I don't think its waterproof but it is a bit of a chore to take off. Even with my Liz Earle Cleanse and Polish, I normally have to go over the eyes again with the remover. My only issue is that it irritates my eyes when I wear it on the bottom lashes. At first I thought it was just hayfever or my eyeliner giving me gyp (the rimmel one really hurts my eyes!). But after not applying it to the bottom ones I realised it was the mascara that was making my eye water! Its such a shame because if it didnt give me watery lower lash line it would be my perfect mascara! I do have really sensitive eyes so this could just be a personal issue with just myself. However I can just use it on the top eyelashes without irritation, I experienced no trouble when I wore it on the top lashes alone with a different one on the bottom. I think the price is perfect (£6.49) I don't tend to buy high end mascara as I think that drugstore counterparts are equally as good! I normally buy the Max Factor False lash effect which is around a tenner so compared to that its fairly cheap. I think I would purchase this again in the future despite the issues with my lower lash line. I love the darkness and the volume it gives without having to over apply it! Agree, I believe the main effect maker of an maskara is the brush anyways, not the liquid! I'm exactly the same, the feeling of mascara is so irritating! Thank you for the review, Must try it out. Hey..I have the same problem with mascara I just can't wear it because it itches my eyes, so I just refuse to wear it. But thanks for the review hun..